First, Ram trucks offer you the highest towing capacity. If you need to tow equipment to clear snow from the roads or you need to load up a trailer with vehicles that break down in the bitter cold, then a Ram truck can go the distance. You’ll get 35,100 pounds of towing capacity with the new Ram 3500. Of course, payloads are another thing to consider this season, as you’ll likely need to haul equipment or raw materials from one destination to the next. Ram trucks also offer you the heaviest payloads, specifically when you choose the Ram 3500. This truck offers 7,680 pounds of payload capacity for your biggest cold-weather hauls. You’ll want to stay comfortable and connected as you travel around in the cold. 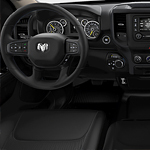 Enjoy the new Uconnect 4C system that gives you access to your infotainment, camera views, and other content from a huge 12-inch touchscreen display. The fourth-generation SiriusXM Guardian Connected Services system gives you the opportunity to connect your devices to 4G Wi-Fi when you’re out on the road, which could come in handy if you get stuck in traffic due to unexpected ice or snow. Additionally, Ram trucks offer you an extensive variety of technology systems that work to improve your security and safety on the road. Let’s face it: winter is a tricky time for drivers, with reduced visibility and traction control due to heavy precipitation. You can make use of blind-spot monitoring to increase your view of the other vehicles in your vicinity before making lane changes. Automatic emergency braking helps you come to a stop when you need it most. You can also enjoy the confidence of the all-new Frequency Response Damping (FRD) shocks that enable you to increase your comfort and handling on the road. A heat exchanger system also helps you to quickly and efficiently warm up your engine and transmission fluids in the winter weather. When you’re ready to get inside a Ram truck, contact our Ram sales agents to let us know when would be a good time for your test drive appointment. We look forward to sharing our enthusiasm about Ram trucks with you!